Walter Roland Neufeld: music teacher; born on 27 March 1924 in Dallas, Oregon, USA, the eighth of nine children of Johann J. Neufeld (29 May 1881, Stavropol, Caucasus, South Russia - 24 April 1967, Vancouver, British Columbia, Canada) and Anna (Wiebe) Neufeld (21 December 1883, Neuendorf, Chortitza Mennonite Settlement, South Russia – 17 December 1965, Surrey, British Columbia, Canada). He never married. Walter died on 5 July 2004 in Abbotsford, British Columbia, where he was buried. Walter’s parents both immigrated with their parents to Canada and were married in Winkler, Manitoba. The family moved frequently while their children were born, having moved from Saskatchewan to Oregon during the time that Walter was born before moving back to Saskatchewan again. Walter’s father, John, was a devout but somewhat contentious individual who found himself at odds with the Mennonite church. Perhaps as a consequence, Walter was never baptized, but remained deeply loyal to Mennonite beliefs and traditions. The family lived briefly in Yarrow, British Columbia (BC), before moving on to Strawberry Hill (now Surrey), BC. 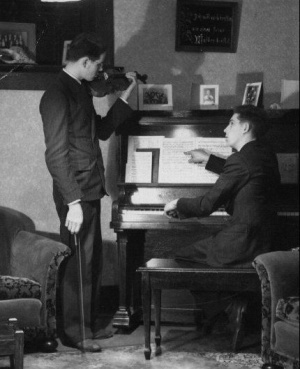 Walter, like his brother Menno, was trained musically by well-known instructors; he studied in New York and Los Angeles. In the early 1940s Walter began teaching in Yarrow, beginning in a berry-pickers' shack, then in a school building located on the Yarrow MB Church property, and finally in private homes. Menno followed Walter to Yarrow, and the number of students swelled rapidly. Walter Neufeld started a string orchestra and organized recitals. There was some initial resistance to "artistic music," but the Mennonite community was soon won over by the Neufelds' persistence. Walter's string orchestra at one point won raves from John Avison, later conductor of the Canadian Broadcasting Corporation Orchestra; the excellence of Neufeld's ensemble frequently surprised "outsiders" to the village of Yarrow. Walter Neufeld was single-minded in his pursuit of music, and expected the same of his students. One evening, when several male members of the orchestra decided to miss rehearsal in favour of a Jersey Joe Walcott/Joe Louis fight, Neufeld drove door to door picking up his delinquent students. On another occasion, Neufeld trudged several miles to Yarrow through heavy snowfall, only to discover that students were not expecting him and so did not show up for lessons. Walter Neufeld was sometime controlling of his students; on the other hand, he was a calm and reassuring individual. His string orchestra frequently accompanied oratorios sung by the Bethel Choir conducted by Menno. In the mid-1960s, Walter and Menno Neufeld, with their orchestra and choir, recorded an LP with evangelist and singer Hildor Janz. Walter traveled to Italy where he bought violins, and to Japan, where he visited the famous Suzuki violin school. By this time, however, the Mennonite community in Yarrow was declining, and the two Neufeld brothers moved to a small studio on Clearbrook Road across from what was then the Mennonite Educational Institute in Clearbrook (now Abbotsford), BC. The studio also served as a residence and as a rehearsal hall for the string orchestra; the ceiling of the rehearsal room was lined with egg cartons for better acoustics. Walter and Menno Neufeld were an inseparable fixture on Clearbrook streets and in local restaurants. Neither married. They involved themselves in some small business deals, particularly in real estate. Eventually the studio was sold, and the brothers moved to a large house with ample teaching space, and finally into a condominium suite. In 1989 a dinner and concert were arranged by the community in their honor. Menno died in 2002, and Walter was never the same. His final years were spent in the Menno Home in Abbotsford. Walter suffered from dementia in his later years, but was overjoyed when former students of the Neufelds performed a concert for him at Menno Home. He died shortly afterwards. GRANDMA (The Genealogical Registry and Database of Mennonite Ancestry) Database, 6.02 ed. Fresno, CA: California Mennonite Historical Society, 2010: #667481. Martens, Robert. "Music for Life: Walter and Menno Neufeld." In Village of Unsettled Yearnings, edited by Leonard Neufeldt, Lora Sawatsky, and Robert Martens. Victoria: TouchWood Editions, 2002: 254-261. Martens, Robert. "Neufeld, Walter Roland (1924-2004)." Global Anabaptist Mennonite Encyclopedia Online. April 2010. Web. 25 Apr 2019. http://gameo.org/index.php?title=Neufeld,_Walter_Roland_(1924-2004)&oldid=155898. Martens, Robert. (April 2010). Neufeld, Walter Roland (1924-2004). Global Anabaptist Mennonite Encyclopedia Online. Retrieved 25 April 2019, from http://gameo.org/index.php?title=Neufeld,_Walter_Roland_(1924-2004)&oldid=155898. This page was last modified on 2 December 2017, at 20:15.